Contained in Governor Brown’s proposed budget is a 20-30% tax rate increase on small business owners. If approved, Governor Brown’s tax increase would result in Oregon’s small and family business owners paying a tax rate nearly 30% higher than Wall Street firms that produce the same product or raise the same crop in Oregon. This proposal is truly outrageous — why would Governor Brown favor large interests over small businesses? In addition, the Governor is proposing a 300% increase in the tax rate on Oregon ICDISC exporter companies (Interest Charge Domestic International Sales Corporations) during a time when agricultural exporters are already facing huge barriers to export trade. SB 520: Irrigation Districts Recall Elections — This bill requires that a recall election of an irrigation district officer follow the standard state election law procedures for recalling of public officers. This is a “fix-it” bill to correct an oversight in Oregon election law. SB 873: Right to Farm (Marijuana Fix) — Specifies that cities and counties may not adopt regulations limiting or prohibiting production of marijuana or propagation of marijuana plants occurring on land designated for exclusive farm use. This bill would undo the right-to-farm exemption for marijuana that was approved last session. HB 2371 and HB 2372: Industrial Hemp Housekeeping Bills — Directs Oregon Department of Agriculture to create consumer safety testing protocols and clarifies that Industrial Hemp is an agricultural product regulated under the exclusive authority of the ODA. Provides process for mitigation for hemp that tests between 0.3% and 1% THC and provides protection from criminal prosecution for unintentionally exceeding the 0.3% THC threshold. 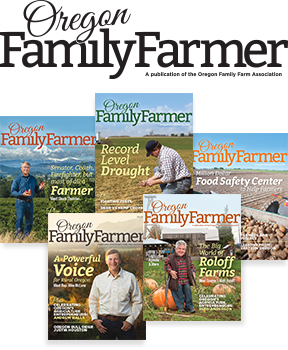 SB523: Board members/ Officers Owe Fiduciary Duty to Cooperative — With a recent failure of another major Oregon agricultural cooperative, this bill is an important fix to help protect family farmers from future losses. The bill clarifies that directors and officers of cooperatives owe a fiduciary duty to the cooperative members. Oregon law on this issue appears to be inconsistent with federal court rulings. Obviously officers and board members of cooperatives should owe the co-op members a duty of loyalty in protecting their financial interest. The major improvement in the law would make it clear that the officers (CEOs, CFOs, etc.) would also owe a fiduciary duty to coop members, discouraging misleading financials presented to cooperative boards that lead to long-term problems. SB524: Misrepresentation in Cooperative Contracts — The bill provides that a long-term binding contract with a cooperative is void if a board member, officer, or agent of the cooperative misrepresents the financial condition of the cooperative, or misrepresents a term or condition of a contract, to induce the member of the cooperative to enter into the contract. This is vital in protecting farmers from being stuck in a long-term binding contract, when they were misled with false statements and false representations to get them to sign a contract with a cooperative. HB 2179: Fixing farm/biosolids decision — Oregon law allows biosolid application on farm fields, provided the biosolids aren’t applied to crops used for human consumption. In order to get a permit to apply biosolids, the farmer or applicator must obtain a permit from DEQ. Current land use law (ORS 215.213 and ORS 215.283) refers to the “application” of biosolids. Most counties interpret the word “application” to allow both the spraying of the biosolid onto the fields and the preparation of the biosolids for spraying. Jackson County took the odd position that getting the biosolids ready for application is not the same thing as applying them, and prohibited the applicator from treating the biosolids on site. This bill fixes that problem.